Profit for a Purpose is an integral part of our business culture at Premier Automotive. We believe that in order to grow and prosper we must serve the communities in which reside. 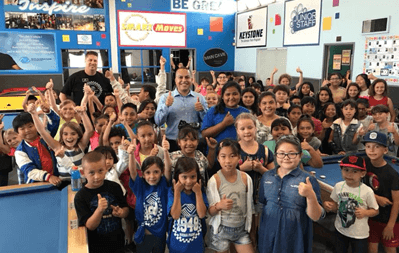 Each of our dealerships accumulates funds on a monthly basis solely to plant seeds in their respective communities by serving their local non-profits and partaking in community efforts. The experience our employees gain from spending time serving together is one we could never replace. 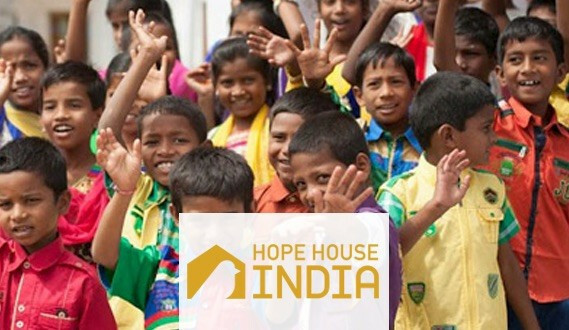 Through Profit for a Purpose our nationwide group is able to connect on a deeper level by sharing our experiences of service. For more information on what Premier dealers are doing in your area please continue to the individual dealership pages! This year Toyota of New Orleans was awarded the Best in Town award by Toyota at their new car show which is given each year to dealers who participate in community outreach efforts. Premier Automotive is extremely proud of the team at Toyota of New Orleans for all of the effort and hard work they put into being a part of their community. We are excited to share this news with our employees and customers! At Premier, our philosophy of 'Profit for a Purpose' allows us to make community outreach a major part of our daily lives. It is through our employees that make the concept of 'Profit for a Purpose' a reality. 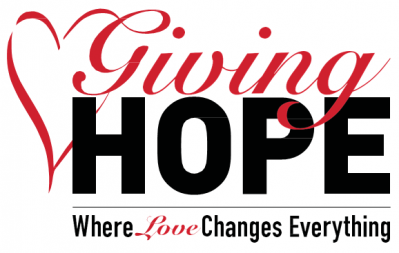 Giving Hope is a family foundation which encompasses several outreaches, by partnering with Giving Hope everyone is able to find a cause that they relate closely to. 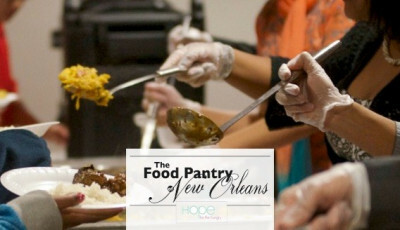 The Food Pantry of New Orleans is a full service Food Pantry and Hot Meal distribution center targeting both the children and the elderly of New Orleans East. We excited to have Giving HOPE and Second Harvest work together to open and operate a much needed resource in New Orleans East. 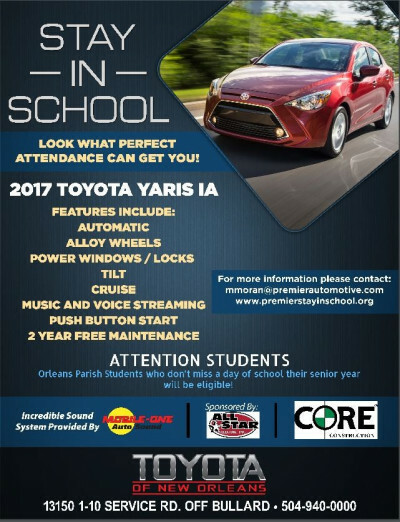 '16-'17 Schoolyear we are giving away a 2017 Toyota IA to a high school senior with perfect attendance! Features include automatic transmission, power windows and locks, keyless entry, rear spoiler, window tint, double overhead cam 16-valve VVT-I 4 cylinder engine, 125 HP, and custom paint job. The runners up will receive scholarship money for the school of their choice. 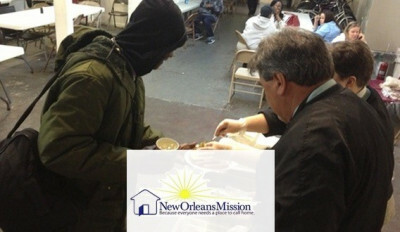 The New Orleans Mission is a rescue and relieve center for the homeless and hungry in and around the New Orleans area. The work they accomplish on a daily basis in our city is truly amazing; from getting people off of the streets and adapting new lives with a positive path. 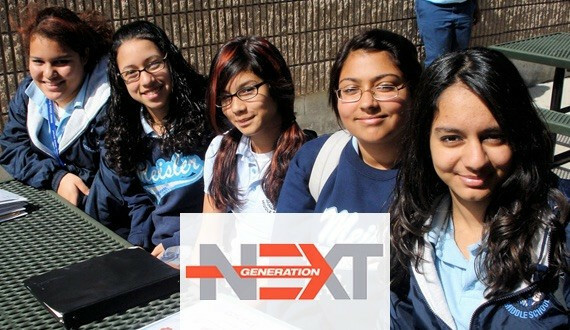 Next Generation Clubs goal is to change the culture in our local schools and to make a positive atmosphere for our youth! By instituting pizza lunches, social functions and other activities they strive to keep students in school and on a positive path in life..